Regular online communication keeps your students engaged and focused, and course teams that communicate effectively online provide a minimum of three updates per week. There are a number of tools that you can use to provide online communication and you should choose a tool with which you feel most comfortable. myUCA Announcements are widely used across the university and any tutor can make announcements in their course and unit areas. it is possible to add images and videos into myUCA Announcements, and you can also choose to send a copy of the announcement to students’ UCA email account. Announcements made in a course area will be seen by all students on the course, but announcements made in a unit area will only be seen by students enrolled on that particular unit. This short video demonstrates how to use the Announcements tool in myUCA. You might only see your students face-to-face for one or two hours per week, but you can keep them engaged with the curriculum by providing online discussion activities. For example, you might set up a blog or discussion board in a unit and post a weekly discussion question at the end of your lecture. A typical weekly activity might involve posting a link to a video and ask students to reply to your post by adding three questions that they thought of while watching the video. Encourage students to reply to each other’s questions during the week (you’ll also need to engage in the discussion), and then begin your next face-to-face session with a deeper exploration of their questions and the issues raised. You could also ‘flip the classroom’ using online discussion by asking students to respond to a film or article before your teaching session. The session itself can then be used to discuss the questions and comments raised during the online discussion, thereby providing an opportunity for students to use higher order thinking skills such as synthesis and critical evaluation. Blogs are an excellent learning tool for keeping students engaged. Each time a student adds a new post to their blog it appears above the previous one, and this makes it easy for a tutor to browse quickly through the student’s work. The online nature of blogs means that students can upload images, embed videos and add links to other blogs and web pages, making them ideal for organising and evidencing research. Asking students to upload all their ideas, research and reflections to a blog makes is possible for a tutor to both track their progress and quickly identify those students who might be disengaged or having difficulty. The ability to add comments to any blog post is also a powerful means of providing targeted formative feedback on students’ learning, helping them to refine their thinking as they progress through a task. As students are able to see each other’s blogs, it is possible to create opportunities for peer learning and assessment by asking students to view and comment on the work of their peers. Read these blogging tips for more information on how blogs can support student engagement and retention. For many students the experience of going on a work placement can be daunting, and it can also be difficult for tutors to monitor each student’s progress during a work experience unit. Asking students to submit weekly updates of their activities to a blog provides both a means of tracking their engagement and also a supportive community space where the students can see how their peers are progressing. Which blog tool should you use? It is essential that you use a tool with which you feel comfortable – if you are not confident in using an online tool it is unlikely that you will succeed in engaging your students. It is also important to consider the average skill level of your students as asking them to use a tool that is beyond their capabilities will impede their learning and get in the way of the activity. You should also consider the nature of the content they will be uploading and whether or not there are any copyright implications. For example, if the nature of the task involves students gathering and uploading images of recent commercials, or perhaps paintings by living artists, they will not have permission to upload these images onto a blog that is open to the public. A single blog can be set up and all students can view and contribute to it. This is ideal for weekly discussion activities as the activity takes place in a single space. Students can work in groups with each group having their own blog. This is useful for group projects where students can collaborate and share their research and ideas. 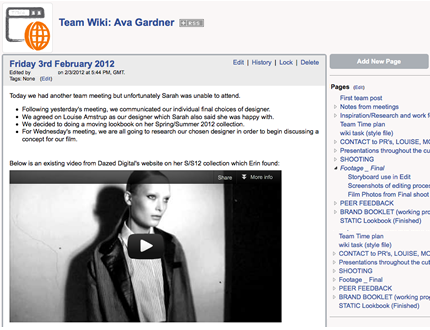 Each group blog can either be visible to the other groups or only available to group members. Each student can have their own blog. This supports individual learning and reflection as the blog functions much like a learning journal or sketchbook. The students’ blogs can be private or can be made visible to other students depending on the nature of the activity. As students have to log in to myUCA to view their blog they may upload content without the need to obtain permission as it is not publicly accessible. If students’ contributions to the blog are being assessed then the myUCA tool makes it easy for tutors to evaluate each student’s contribution to the blog. If, however, you want to encourage students to begin showing their work in public then you might consider using an external blog tool such as Blogger or WordPress. These tools are still relatively simple to use and provide a way for students to begin thinking about how they present themselves to the world. It is almost essential for creative arts graduates to have an online portfolio of their work to show to prospective employers, and encouraging students to begin developing their portfolio while at university helps support their employability. How do you keep track of students’ external blogs? Another way to monitor all your students’ blogs is to simply click the ‘follow’ link on each blog. The advantage of this is that all new posts will appear in your ‘news feed’, making it easy to see what is happening. However, this requires that all students use the same blogging platform and so you should consider making it a requirement that they all use the same blogging tool. Finally, if your students are already using blogs on a range of blogging platforms you can use a tool such as Feedly. This is what’s known as a ‘blog aggregator’, and it enables you to just paste in the URL of any blog that you want to follow. This short tutorial video explains how Feedly works. Group work is an essential part of any university learning experience as it helps students develop a range of transferable skills including teamwork, organisation, negotiation, communication, creative thinking and critical evaluation. Providing opportunities for students to work online in groups strongly supports their development as self-directed learners. There are many online tools which can support group work. The choice of tool varies depending on the nature of the learning activity, and so the following examples from UCA courses are intended to illustrate why the tools chosen were appropriate to the specific activity. The purpose of this activity was to enable students to work in small groups to research a fashion or film celebrity. Students were required to provide evidence of their research and organise their findings in a logical manner. Why was a wiki used? A wiki consists of one or more web pages and enables students to upload images, videos, text and links. It was suited to this activity because students were able to create a separate page for each new topic of their group work such as ‘film photos’, ‘brand booklet’ and ‘time plan’. The ability to add comments under each page meant that students could comment on the work of their group members and discuss their progress before making changes to the actual wiki pages. The use of a myUCA wiki also made it possible for tutors to assess the contributions made by each individual group member and award marks accordingly. This activity required students to work in groups to research their visual inspiration. Students were asked to upload images of the work of other artists, spaces, exhibitions and found objects, and write short text descriptions to explain why the image had inspired them. Why was a blog used? A blog makes it possible to view progress over time, as each new post appears above the previous one. The use of a blog for this activity made it possible for tutors to view and assess how students’ thinking evolved during the unit and understand how their thinking had been shaped through online discussion with group members. 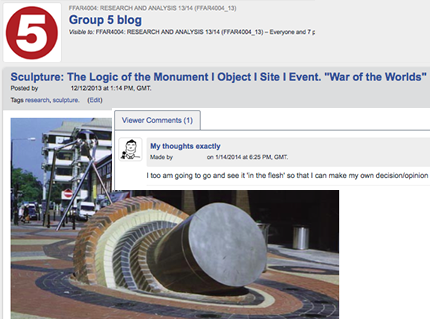 The use of a blog also made it possible for students to apply ‘tags’ to each blog post, enabling them to organise their thinking into topics and themes such as ‘exhibition review’, ‘painting’ or ‘sculpture’. As with the above activity, the myUCA blog tool made it possible for tutors to assess each group member’s contributions. 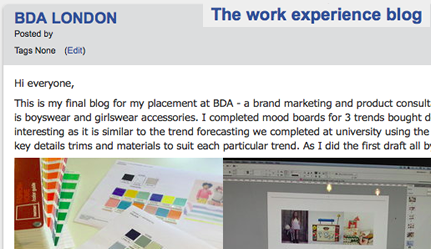 For this activity, the tutor wanted students to work in groups to develop a new fashion trend, replicating the experience of working in a professional design team. Prezi is a tool which enables you to work on a large, blank canvas, rather like an enormous sheet of paper, and this makes it an ideal tool for collating and arranging a large quantity of images and videos. Students worked in small groups and each group was allocated a Prezi, into which they uploaded images and videos around the themes of Past, Present and Future. 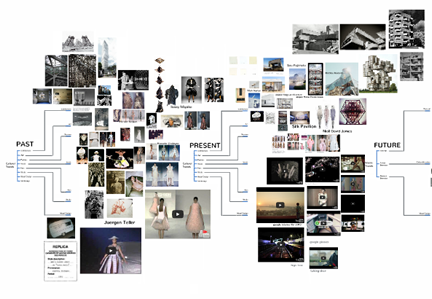 Prezi made it possible to zoom out and obtain an overview of all the uploaded content, and this could then be dragged and arranged on the canvas around the designated themes. The case study below describes the activity in detail and the rationale informing its design. Paddle is a simple blogging platform that can include text, links, photo, video, audio and documents. The page can be arranged in free-form, grid, or stream layouts. In stream format it’s a good way to create a simple, collaborative blog for students. Padlet can be open access and allow anyone to contribute or password protected and even moderated if you require that option. It can be embedded into myUCA while at the same time viewed from any device via a weblink. This slideshow demonstrates the flexibility of Padlet – making it easy to tailor into your planned teaching and learning activities. The example above was a conference workshop activity with six contributors. The layout can be changed in the controls according to type of planned activity.